Call Us For All Your Sod Needs. 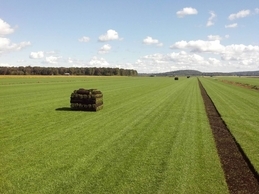 Here at DeBuck's Sod Farm, we work hard to provide our customers with a top quality turf product. We specialize in Kentucky Blue Grass, Fine Fescue and Tall Fescue varieties. Choose DeBuck's Sod to complete your next project! DeBuck's Sod is DeBest Sod! an Inside View of What We Do Here! Perfect for Your Large Sports Field or Commercial Jobsite starting at 6,000sqft. Each DeBuck's Big Roll covers 300 sq. ft. in a continuous flow and can be tightly secured with a single rake. Call us to find out if Big Rolls would work for your Large Project. DeBuck's Sod comes in a 2'x5' roll and makes loading and unloading at relatively easy. We Cut To Order! A standard pallet at DeBuck's contains 600 square feet, BUT Let us know what the sites square footage is and we can cut according to your needs! Delivery available with minimum order of 1800 sqft. Call the office for more information. Do You have a small Area in Your Lawn that You Need To Repair? Are You a Previous Sod Customer and Just Want To Do Some Patch Work? Purchase the seed that we use on our fields! Available for Pick-up at our Farm, Advance Notice is Required. Questions? Check out our Frequently Asked Questions .